For most people in Dallas, the early morning hours of July 7 were the start of just another summer day. The Hillary Clinton e-mail investigation that ended with no criminal charges had many Republicans in Congress calling for another investigation. After a couple of days of unexpected showers, a scorcher of a day was expected with highs reaching up to 100 degrees. And there was news of a march and rally planned for downtown to protest police shootings in other parts of the country. As the morning turned to noon, then to early afternoon, protesters were making plans to travel downtown to take part in the march; police were preparing to be there for crowd control; reporters, photographers and video crews were taking assignments from their newsrooms on where to be stationed throughout the march. And somewhere in the Metroplex, a man who police would later describe as angry and deranged was arming himself for battle. As the evening sun began to cast a shadow over downtown Dallas, hundreds of protesters gathered for the march and rally. With journalists and police by their side, one group watching the crowd and the other chronicling the event, the protesters marched through downtown Dallas. Some even took photographs with officers. 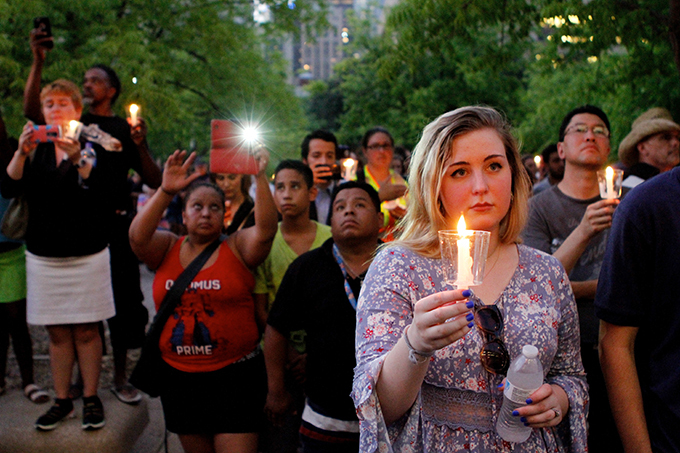 After a rally where the speakers called for an end to racial profiling, dusk turned to dark and the march was nearing its end. Just before 9 p.m., chaos erupted and the city of Dallas would be in the international spotlight once more, a tragedy few could fathom ever would or could happen again. A lone gunman was targeting caucasian police officers, moving to make it appear there was more than one shooter. Television stations broke into regular programming, showing images of people running through the streets, away from the shooting, and of police officers rushing toward the gunfire. Images and sounds captured on cellphones and uploaded to social media began to chronicle the firefight from various angles. As the night wore on, the number of casualties grew from wounded to deceased, with thousands glued to television sets in homes across the country. Emotional images soon emerged from hospitals as doctors, nurses and fellow police officers stood outside as the wounded were being treated inside. As local television stations stayed with the story throughout the night, Mayor Mike Rawlings and Police Chief David O. Brown held news conferences to try to update the city on the situation and keep everyone calm. After a standoff for several hours with the heavily armed and wounded gunman holed up in a second-story garage, Chief Brown said police had detonated an explosive device, killing him. The casualties: Five police officers killed, nine others wounded, along with two civilians. 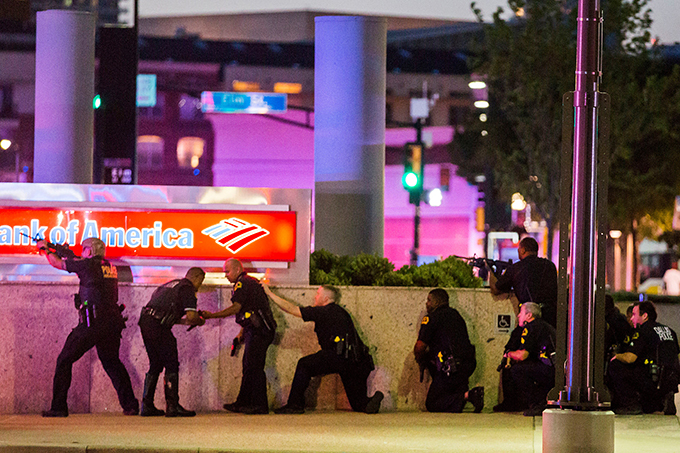 The five officers killed were identified as Dallas police officers Sgt. Michael J. Smith, 55; Senior Cpl. Lorne Ahrens, 48; Officer Michael Krol, 40; and Officer Patrick Zamarippa, 32. Also killed was Brent Thompson, 43, an officer with the Dallas Area Rapid Transit. Sgt. Smith, his wife Heidi and their two daughters, Victoria and Caroline, are part of the Mary Immaculate Catholic Church community in Farmers Branch. So, as the night turned into day, the sunlight on July 8 gave way to images of busted windows downtown, of bullet-riddled police vehicles and of shattered lives; a request from the police chief for better treatment and respect for those taking the oath “to serve and to protect,” and a resolve from city and faith leaders that neither a “coward” targeting police or others bent on disrupting a city would divide the community. Police identified the lone gunman as Michael Xavier Johnson, 25, a former Army Reserve veteran who had served in Afghanistan. Authorities said that during tense negotiations the evening of the attack, Johnson talked about wanting to kill white officers and that explosives had been planted around the area. Authorities have said Johnson was heavily armed when he was killed and that they found other weapons and tactical materials from a search of his home in Mesquite. 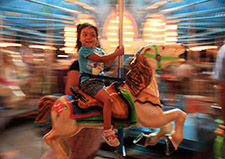 As the news was breaking, journalists from across the world began making their way to the city. For the next several days, the mayor and the police chief were center-stage, trying to calm a city, comfort the families of the fallen officers, lead others in prayer and ask for peace. And as memorials sprang up across the city, alongside blue ribbons tied to trees and downtown skyscrapers awash in blue to honor the fallen officers, the president also came to town. His message was for peace and reconciliation not only in Dallas, but in other cities across the country, and to talk about courage, democracy, and bravery, and a city that was an example of how to do things, of a country to look into itself to find the answers to solve the violence plaguing cities. A few hours after the shootings, a few people lighted several candles in front of the Dallas Police Department Headquarters while hundreds gathered for a memorial at Thanks-Giving Square in downtown Dallas, not far from the site of the ambush. The water garden and memorial park was opened in 1964, a year after the assassination of President John F. Kennedy on Nov. 22, 1963, not far from the spot where the lone gunman had killed the officers a few hours earlier. Bishop Kevin J. Farrell joined city officials and ecumenical leaders at the ceremony. “We have been swept up in the escalating cycle of violence that has now touched us intimately as it has others throughout our country and the world,” the bishop said. “All lives matter: black, white, Muslim, Christian, Hindu. 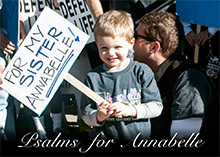 We are all children of God, and all human life is precious. Other city officials and ecumenical leaders also called for love and unity in the face of polarization and adversity. On July 9, Bishop Farrell celebrated a special Mass for Hope and Healing at the Cathedral Shrine of the Virgin of Guadalupe. The Gospel reading at the anticipatory Mass was from Luke 10:25-37, or the parable of the “Good Samaritan” that speaks about love and mercy. Area corporations, businesses, and friends of the families began raising and donating tens of thousands of dollars for the fallen officers. On Sunday, July 10, the officers were remembered in churches, plazas, parks and parking lots across North Texas. Friends of Sgt. Smith’s family gathered for a fundraiser in a shopping center parking lot, less than a mile away from their parish of Mary Immaculate Catholic Church in Farmers Branch, raising close to $40,000. In Corsicana, DART officer Brent Thompson was remembered in his hometown. And in Fort Worth, family and friends of Dallas officer Patrick Zamarippa gathered at Marine Park to remember him. At a city-wide candlelight vigil at Dallas City Hall on July 11, the families of the fallen officers gathered to hear others, mostly the partners of each of the officers, pay tribute to those they called heroes. “I think those that love Mike the most want to honor his legacy by choosing, because it is a choice, not to let our anger drag us into a darker place, but instead choose to continue Mike’s fight for good and to not let the evil prevail,” said Officer Marcie St. John, his former partner. On July 12, President Barack Obama, Vice President Joe Biden, and former President George W. Bush joined the mayor, the police chief, the families of those officers killed and injured, hundreds of other law enforcement officials, and elected and interfaith leaders at the Morton H. Meyerson Symphony Center to remember the “heroes.” Those heroes were represented in the audience not only by their families, but by five seats, each draped in black, with a folded American flag and a policeman’s cap. 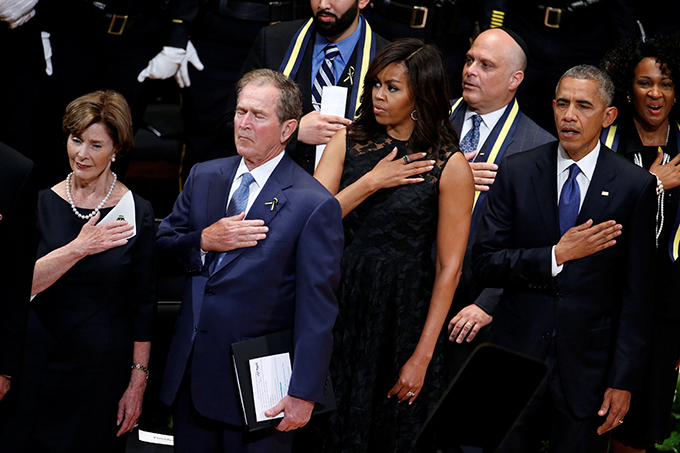 President Obama, former President Bush, the mayor and the police chief all spoke about the courage of the five officers and their commitment to protecting lives. President Obama talked about the incidents that prompted the July 7 rally and shootings in Dallas. On July 5 in Baton Rouge, Louisiana, Alton Sterling, 37, was killed by police during an altercation outside a convenience store after witnesses said that he had a gun. On July 6, in a suburb of Minneapolis-St. Paul, Philando Castile was fatally shot after a traffic stop. The president also acknowledged what Dallas police have been saying over the past several days, that their new community policing policies and tactics have reduced complaints of excessive force by 64 percent. Not long after the president departed, hundreds of officers from across the country began paying respects to the fallen officers, visiting churches across the Metroplex for funerals that would linger for several days. Sgt. Smith’s body was taken to Mary Immaculate Catholic Church for a visitation on July 12. 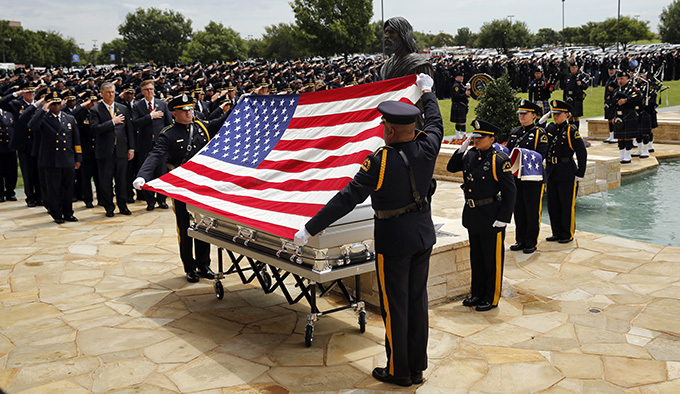 Throughout the evening, the Dallas Police Department Honor Guard continually changed shifts in a ceremony that would ensure that two officers also were next to the casket during the visitation. Hundreds of officers from across the country joined the mayor and police chief and more than 1,000 others in paying their respect. As the crowds thinned after 10 p.m., members of other honor guards from across the country joined in the ceremony of paying last respects. Then the duty fell on two officers, who stood by the body in shifts, through the overnight hours, ensuring that their beloved officer would not be left alone. As sunlight peered through the stained glassed windows shortly after daybreak, the officers were still there and remained with the casket as the American flag that covered it was substituted for the burial pall to begin the Mass. In his homily, Father Michael Forge, the pastor at Mary Immaculate Catholic Church, described the early morning hours at Parkland Hospital after the shooting, as he waited with the family to see their beloved one’s body. He said there were countless police officers streaming through the room, offering words of encouragement and condolences. “I immediately answered and said: ‘Oh Caroline, God didn’t do this. The anti-God did this, the evil one did this,’ ” he said. 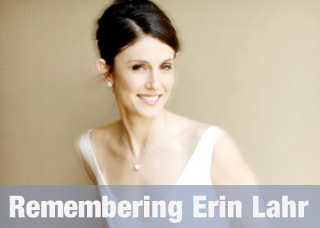 In her eulogy, Sgt. Smith’s sister, Yea-Mei Sauer, talked about a brother who even in his youth was a role model to her and to her other brother, William, well into middle age. She said he loved his family and his family of police officers and he always wanted the best for his family. At services for the other fallen officers, they were remembered as strong, quiet, funny men who were like many other men and who loved their families at home and those on the police force. And their families vowed to never forget them. Several make-shift memorials have popped up across the city. Trees in dozens of neighborhoods now sport blue ribbons tied around them. Dallas Strong or One Dallas signs can be found throughout the city, with and without the hastags. 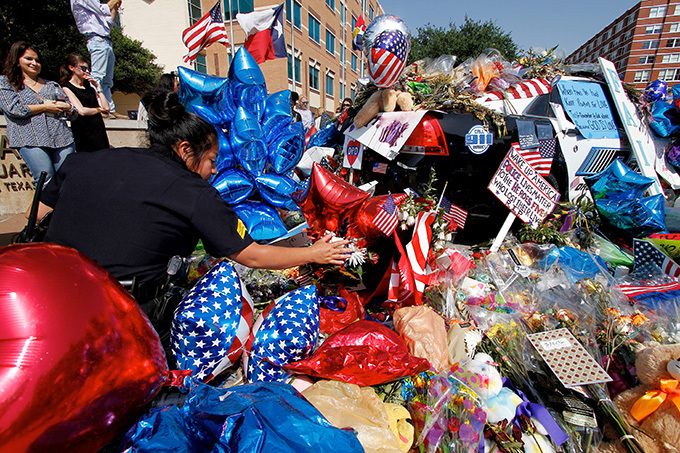 As the city said goodbye to the Dallas officers, the memorial that had started out in the plaza in front of Dallas Police headquarters with a single candle evolved into two police cars—one representing the Dallas Police Department and the other, the Dallas Area Rapid Transit—with a few flowers on top of them. Within a few days, more flowers, cards, letters, posters, balloons, and candles buried the cars. The news networks set up their tents and cameras on the site. Hundreds of people traveled from across the country to the plaza. Some went to take photos and a few went to try to get on television. Many of them went to hug an officer and to pray with them. Many went there just to cry. Still, others went there to see the goodness that had come from evil. 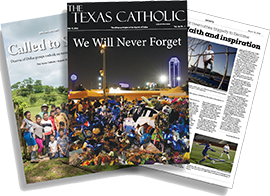 Also contributing to this story were Texas Catholic staff writers Michael Gresham, Cathy Harasta, Seth Gonzales, Jenna Teter and Anahí Pérez Faz. 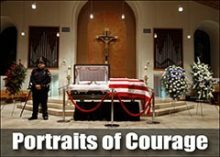 For additional coverage, view The Texas Catholic’s Portraits of Courage coverage. 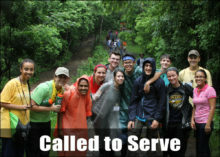 Next article To Serve. To Protect. To Honor.